The Republic of Texas was admitted to the Union as the 28th U.S. state on December 29, 1845. 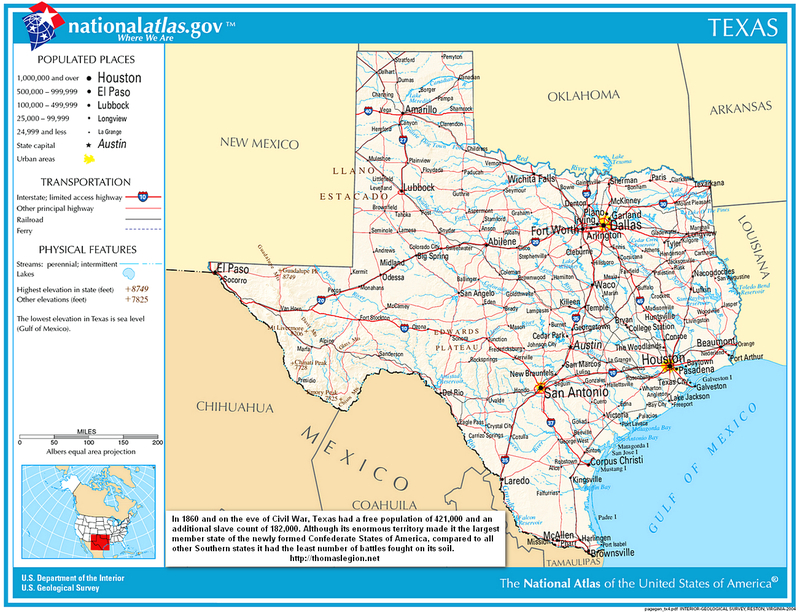 Texas shares an international border with the Mexican states of Chihuahua, Coahuila, Nuevo León and Tamaulipas to the south, and borders the US states of New Mexico to the west, Oklahoma to the north, Arkansas to the northeast and Louisiana to the east. No single culture was dominant in the present-day Texas region and many different peoples inhabited the area. 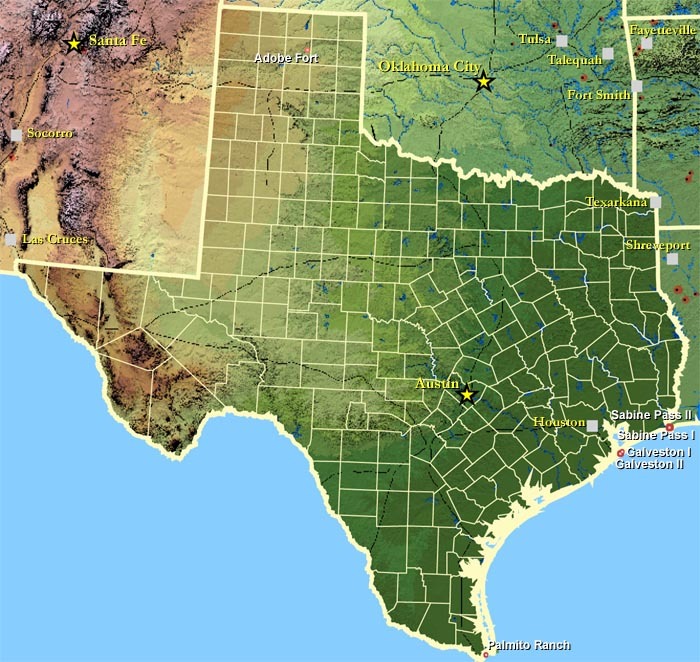 Native American tribes that lived inside the boundaries of present-day Texas include the Alabama, Apache, Atakapan, Bidai, Caddo, Coahuiltecan, Comanche, Cherokee, Choctaw, Coushatta, Hasinai, Jumano, Karankawa, Kickapoo, Kiowa, Tonkawa, and Wichita. During the nineteenth century, as part of the Cotton Kingdom, planters in parts of Texas depended on slave labor. In 1860, according to the U.S. census, Texas had a total population of 604,215, of which 182,566 were enslaved. In the statewide election on the secession ordinance, Texans voted to secede from the Union by a vote of 46,129 to 14,697 (a 76% majority). The Secession Convention immediately organized a government, replacing Sam Houston when he refused to take an oath of allegiance to the Confederacy. Texas declared its secession from the United States on February 1, 1861, and joined the Confederate States of America on March 2, 1861. On February 16, 1861, U.S. General David E. Twiggs, commander of Federal forces in Texas, surrendered the United States arsenal in San Antonio to secessionist volunteers led by the famed Texas Ranger Ben McCulloch, along with all additional army posts and property in Texas. Twiggs ordered all 3000 Army troops stationed in Texas — mostly in defense of the Indian frontier — to march to the coast to be evacuated. Texas, now firmly in Confederate control, also took possession of thousands of U.S. Army muskets and ammunition. Twiggs, deemed a traitor by Washington, soon joined the Confederate Army. During the American Civil War (1861-1865), Texas excelled at supplying soldiers and cavalry units for the Confederacy. The Lone Star State was mainly a "supply state" for the Confederate forces until mid-1863. Union forces subsequently captured various points of the Mississippi River, thus making large movements of men, horses or cattle impossible. Some cotton was sold in Mexico, but most of the crop became useless because of the Federal naval blockade of Galveston and other ports. Before the conflict, Galveston was the only major business center in Texas. Enjoying a luxurious lifestyle compared with the rest of frontier Texas, the city was the export point for most of the cotton in Texas along with other products like sugar and molasses. But by 1862, the Union navy had blockaded the Texas coast. Galveston was withering. The city’s residents were ordered to evacuate in May 1862, along with their livestock and supplies. Many crowded into refugee camps in Houston along with hundreds who had fled the war in Louisiana. Federal attacks on Corpus Christi, Sabine Pass, and Beaumont set the stage for the events of October 4, 1862, when Federal warships sailed into Galveston Harbor and seized control of the defenseless city. By Christmas Day, when 260 Massachusetts infantrymen began an occupation of the waterfront, Galveston was all but a ghost town. In a dramatic reversal of fortunes, however, Confederate forces staged a surprise invasion on New Year’s Day, 1863, leading thousands of troops into town over the abandoned railroad bridge to the mainland. In a coordinated operation, two Confederate gunboats fought to an unlikely victory over six Union ships in Galveston Harbor. The audacious recapture of Galveston exhilarated Texas and made heroes of the men who participated. From the Federal perspective, it was one of the great debacles of the war. Texas regiments fought in every major battle throughout the war. The last battle of the Civil War, the Battle of Palmito Ranch, was fought in Texas on May 12, 1865. The history of slavery in Texas began slowly, as the Spanish did not rely on it for labor during their years of control. The use of slavery expanded in the mid-nineteenth century as British-American settlers from the Southeastern United States crossed the Mississippi River and brought slaves with them. Although the Spanish colonists had held some slaves, they did not succeed in creating a sustainable agricultural economy in the entirety of New Spain, including Texas, Mexico, Central America, and other former Spanish territories in the American Southwest. The issue of slavery became a source of contention between the Anglo-American settlers and Spanish governors. The governors feared the growth in the Anglo-American population in Texas, and for various reasons, by the early 19th century, they and their superiors in Mexico City disapproved of expanding slavery. In 1829 the Guerrero decree conditionally abolished slavery throughout Mexican territories. It was a decision that increased tensions with slaveholders among the Anglo-Americans. After the Texas Revolution ended in 1836, European Americans greatly increased the enslaved population in the Republic, and later the State of Texas as they encouraged settlement and developed more acres under cultivation in cotton and other commodities. The cotton industry flourished in East Texas, where enslaved labor became most widely used. The central part of the state was dominated by subsistence farmers. Free and runaway blacks had great difficulty finding jobs in Texas. Many worked in other parts of the state as cowboys herding cattle or migrated for better opportunities in the Midwest, California, or southward to Mexico. In the winter of 1861, Texas counties sent delegates to a special convention to debate the merits of secession. The convention adopted an Ordinance of Secession by a vote of 166 to 8, which was ratified by a popular referendum on February 23, 1861. Following the election of Abraham Lincoln in 1860, public opinion in the cotton states of the Deep South (South Carolina through Texas) swung in favor of secession. By February 1861, the other six states of the sub-region had separately passed ordinances of secession. Unlike the other "Cotton States" chief executives, who took the initiative in secessionist efforts, Sam Houston refused to call the Texas Legislature into special session to consider the question, relenting only when it became apparent citizens were prepared to act without him. In December 1860, a group of state officials drew up a petition declaring Lincoln's election an imminent danger to Southern rights and called for a statewide election of delegates to assemble in convention in January to decide Texas' course. Houston called the legislature into session, gambling that the elected body might be inclined—or persuaded—to block any separatist action by the convention. On January 21, 1861, the legislature met in Austin and was addressed by Houston. Calling Lincoln's election "unfortunate," he nonetheless emphasized, in a reference to the upcoming meeting of the secession convention, it was no justification for "rash action". The Texas Legislature voted the delegates expense money and supplies. Over Houston's veto, the Legislature made a pledge to uphold the legality of the Convention's actions, requiring only that the people of Texas have the final say in referendum. With gubernatorial forces routed, the Secession Convention convened on January 28 and, in the first order of business, voted to back the legislature 140–28 in that an ordinance of secession, if adopted, be submitted for state-wide consideration. The following day, convention president Oran Roberts introduced a resolution suggesting Texas leave the Union. The ordinance was read on the floor the next day, citing the failures of the Federal government to protect the lives and property of Texas citizens and accusing the Northern states of using the same as a weapon to "strike down the interests and prosperity" of the Southern people. After the grievances were listed, the ordinance repealed the ordinance of July 4, 1845, in which Texas approved annexation by the United States and the Constitution of the United States, and revoked all powers of, obligations to, and allegiance to the Federal government and the U.S. Constitution. In the interests of historical significance and posterity, the ordinance was written to take effect on March 2, the date of Texas Declaration of Independence (and, coincidentally, Houston's birthday). On February 1, members of the legislature, and a huge crowd of private citizens, packed the House galleries and balcony to watch the final vote on the question of secession. Seventy "yea" votes were recorded before there was a single "nay." One of the negative votes is enshrined in Texas history books. James Webb Throckmorton, from Collin County in North Texas, in response to the roar of hisses and boos and catcalls which greeted his decision, retorted, "When the rabble hiss, well may patriots tremble." Appreciating his style, the crowd afforded him a grudging round of applause (like many Texans who initially opposed secession, Throckmorton accepted the result and served his state, rising to the rank of brigadier-general in the Confederate army). The final tally for secession was 166–7, a vote whose legality was upheld by the Texas Legislature on February 7. Other than in South Carolina, where the vote was unanimous, this was the highest percentage of any other state of the Lower South. The decision was further affirmed on February 23 when a statewide referendum resulted in Texas voters overwhelmingly approving the measure. The last order of business was to appoint a delegation to represent Texas in Montgomery, Alabama, where their counterparts from the other six seceding states were meeting to form a new confederacy. On March 4, the convention assembled again to formally declare Texas out of the Union and to approve the Constitution of the Confederate States of America, which had been drawn up by its Provisional Congress. Houston accepted secession but asserted that the Convention had no power to link the state with the new Southern Confederacy. Instead, he urged that Texas revert to its former status as an independent republic and stay neutral. Houston took his seat on March 16, the date state officials were scheduled to take an oath of allegiance to the Confederacy. He remained silent as his name was called out three times and, after failing to respond, the office of governor was declared vacant and Houston was deposed from office. Despite the prevailing view of the vast majority of the state's politicians and the delegates to the Secession Convention, there was a significant number of Texans who opposed secession. The referendum on the issue indicated that some 25% favored remaining in the Union at the time the question was originally considered. The largest concentration of anti-secession sentiment was among the German population in the Texas Hill Country, and in some of the counties of North Texas. In the latter region, most of the residents were originally from states of the Upper South, where secession was rejected until the incident at Ft. Sumter forced a choosing of sides. Likewise, in Texas, most of those initially against secession accepted the verdict and, when hostilities commenced, fought for or supported the Confederacy. However, while the overwhelming majority of Texans in active military service supported the South, approximately 2000 remained loyal to the Union ranks. In August 1862, Texans massacred a band of Germans along the Nueces River. The German population around Austin County, led by Paul Machemehl, was successful in reaching Mexico. In October of 1862, approximately 150 settlers belonging to a secretive Union League in and around Cooke County on the Red River were arrested by the 11th Texas Cavalry led by Colonel William C. Young on the orders of Colonel James Bourland, Confederate provost marshall for northern Texas. A court was convened in Gainesville to try the men accused of plotting to seize the arsenals at Sherman and Gainesville and to kill their loyal Confederate neighbors, seize their property, and to cooperate with Union army forces poised to invade northern Texas from Arkansas and/or Indian Territory. The plot was quite real; Young and Bourland found several large caches of weapons, and many of the accused admitted their guilt and divulged their secret grip, signs, and password ("Arizona") to the court. Several of the ringleaders were hanged in what is now downtown Gainesville during the first week of October. It appeared that the matter had been put to rest, but while the jury recessed, an unknown assassin killed Colonel Young from ambush, and the trials restarted in earnest. Nineteen additional suspects were found guilty and hanged before the end of the month. A total of about forty conspirators were hanged in Gainesville, two were shot while trying to escape, and two more were hanged elsewhere after being turned over to a military tribunal at their own request. There was never an assembled mob, as some have suggested, at any time. Under the primitive conditions that obtained on the Texas frontier during the Civil War, the legal proceedings, however imperfect, were about as deliberate and legitimate as could be expected. Accusations of a kangaroo court are clearly refuted by the fact that of the 150 defendants to come before the court, more than two-thirds were found not guilty and immediately released without so much as even paying a fine. A granite monument in a small park marks the spot where the hangings took place. The Confederacy's conscription act proved controversial, not only in Texas but all across the South. Opponents argued that the war was being fought by poor people on behalf of the wealthy minority. The Act exempted from the draft men who owned fifteen or more slaves. Sam Houston was probably the premier "Unionist" in Texas. Like most of the same in the South, he strongly believed in the doctrine of states’ rights, and even assured his fellow Texans he would personally lead the state out of the Union should matters justify such. However, he thought secession at the moment in time was "rash action," and certain to lead to a conflict sure to favor– in the long run– the industrial and populated North. He predicted: "Let me tell you what is coming. After the sacrifice of countless millions of treasure and hundreds of thousands of lives you may win Southern independence if God be not against you, but I doubt it. The North is determined to preserve this Union. They are not a fiery impulsive people as we are...but once they begin to move in a given direction, they move with the steady momentum of a mighty avalanche, and what I fear is that they will overwhelm the South with ignoble defeat." Houston accepted the result of the secession convention, but he believed, with his strong attachment to the old Union, Texas had overstepped its authority in becoming a member state of the newly formed Confederacy. Houston subsequently refused to take an oath of allegiance, and was deposed from office. Houston retired from public life, although his son and namesake distinguished himself in Confederate service. Houston, moreover, later wrote a friend: "There comes a time a man's section is his country...I stand with mine. I was a conservative citizen of the United States...I am now a conservative citizen of the Southern Confederacy." According to the 1860 U.S. census, Texas had a free population of 421,649 and an additional slave population of 182,566. After Texas passed its Ordinance of Secession, the state government appointed four men as "commissioners of public safety" to negotiate with the Federal government for the safe transfer of military installations and bases in Texas to the Confederates. Along with land baron Samuel A. Maverick and Thomas J. Devine, Dr. Philip N. Luckett met with U.S. Army General David E. Twiggs on February 8, 1861, to arrange the surrender of the Federal property in San Antonio, including the military stores being housed in the old Alamo mission. As a result of the negotiations, Twiggs delivered his entire command and its associated Army property (10,000 rifled muskets) to the Confederacy, an act that brought cries of treason from Unionists throughout the state. Almost immediately, Twiggs was dismissed from the army by President Buchanan for “treachery to the flag of his country." Shortly afterwards, he accepted a commission as general in the Confederate army but was so upset by being branded a traitor that he wrote a letter to Buchanan stating the intention to call upon him for a "personal interview" (then a common euphemism to fight a duel). Robert E. Lee, then still a colonel in the US Army, was in San Antonio at the time and when he heard the news of the surrender to Texas authorities, responded, "Has it come so soon as this?" Texas did not experience many significant battles. The Union, however, mounted several attempts to capture the Trans-Mississippi regions of Texas and Louisiana from 1862 until the war's end. With ports to the east blockaded or captured, Texas in particular became a blockade-running haven. Referred to as the "back door" of the Confederacy, Texas and western Louisiana continued to provide cotton crops that were transferred overland to Mexican border towns and then shipped to Europe in exchange for supplies. Determined to close this trade, the Union mounted several attacks, each of them unsuccessful. Nearly 90,000 Texans served in the Confederate Army, and Texas regiments fought in every major battle throughout the war. Some men were veterans of the Mexican-American War; a few had served in the earlier Texas Revolution. The state furnished 45 regiments of cavalry, 23 regiments of infantry, 12 battalions of cavalry, four battalions of infantry, five regiments of heavy artillery and 30 batteries of light artillery for the Confederacy. In addition, the state maintained, at its own expense, some additional troops that were for home defense. These included 5 regiments and 4 battalions of cavalry, and 4 regiments and one battalion of infantry. In 1862, the Confederate Congress in Richmond, Virginia, passed a conscription law that ordered all males from 18 to 45 years of age to be placed in the service, except ministers, state, city and county officers and certain slave owners. All persons holding 15 or more slaves were exempt. When the first companies of Texas soldiers reached Richmond, Virginia, Confederate President Jefferson Davis greeted them with the words: "Texans! The troops of other states have their reputations to gain, but the sons of the defenders of the Alamo have theirs to maintain. I am assured that you will be faithful to the trust." Among the most famous units were the Terry's Texas Rangers (a group of frontier cavalrymen, many of whom later became peacekeepers in the Old West), "Walker's Greyhounds," the Texas 33rd Cavalry Regiment led by Col. Santos Benavides and "The Texas Brigade" (aka "Hood's Brigade"), a brigade composed mainly of Texas regiments augmented at times by the 18th Georgia Infantry, Hampton's (South Carolina) Legion, and the 3rd Arkansas Infantry, and originally commanded by John Bell Hood. Known as the "shock troops" of the Army of Northern Virginia, (Hood's) Texas Brigade were "always favorites" of General Robert E. Lee and, on more than one occasion, he praised their fighting qualities, remarking that none had brought greater honor to their native state than "my Texans." Hood's men suffered severe casualties in a number of fights, most notably at the Battle of Antietam, where they faced off with the Iron Brigade, and at Gettysburg, where they assaulted Houck's Ridge and then Little Round Top. Approximately 2,000 Texas men joined the Union army. Notable among them was future governor Edmund J. Davis who initially commanded the 1st Texas Cavalry (Union) and rose to the rank of brigadier general. Texas's relatively large German population around Austin County led by Paul Machemehl tried to remain neutral in the war but eventually left Confederate Texas for Mexico. East Texas gave the most support to secession. In 1862, Abraham Lincoln named a former United States Congressman, Andrew J. Hamilton, as the Military Governor of Texas. Hamilton would serve throughout the war, and would be named as the first provisional civilian governor during the early stages of Reconstruction. A number of notable leaders were associated with Texas during the Civil War. John Bell Hood gained fame as the commander of the Texas Brigade in the Army of Northern Virginia and played a prominent role as an army commander late in the war. "Sul" Ross was a significant leader in a number of Trans-Mississippi Confederate armies. Felix Huston Robertson was the only native Texan Confederate general. Capt. T.J. Goree was one of Lt. General James Longstreet's most trusted aides. John H. Reagan was an influential member of Jefferson Davis's cabinet. Col. Santos Benavides was a Confederate colonel during the American Civil War. Benavides was the highest-ranking Tejano soldier to serve in the Confederate military. The office of Governor of Texas was in flux throughout the war, with several men in power at various times. Sam Houston was governor when Texas seceded from the United States, but refused to declare any loyalty to the new Confederacy. He was replaced by Lieutenant Governor Edward Clark. Clark completed the rest of Houston's term in 1861, and narrowly lost re-election by just 124 votes to Francis Lubbock. During his tenure, Lubbock supported Confederate conscription, working to draft all able-bodied men, including resident aliens, into the Confederate Army. When Lubbock's term ended in 1863, he joined the military. Ardent secessionist Pendleton Murrah replaced him in office. Even after Robert E. Lee surrendered in 1865, Murrah encouraged Texans to continue the revolution, and he and several supporters fled to Mexico. During the war, the U.S. Navy blockaded the principal seaport, Galveston, for four years, and Federal infantry occupied the city for three months in late 1862. Confederate troops under Gen. John B. Magruder recaptured the city on January 1, 1863 and it remained in Confederate hands until the end of the war. A few days later the Confederate raider CSS Alabama attacked and sunk the USS Hatteras in a naval engagement off the coast of Galveston. A few other cities also fell to Union troops at times during the war, including Port Lavaca, Indianola, and Brownsville. Federal attempts to seize control of Laredo, Corpus Christi, and Sabine Pass failed. By the end of the war no territory was in Union hands. The border with Native Americans to the west of San Antonio, Austin, and Fort Worth, on the other hand, proved of great concern to Texas throughout the war. Kiowas, Comanches, and Apaches provoked fear in settlers as they attacked throughout the western part of the state. As the war progressed, deserters fleeing from the war also used the Texas frontier as a refuge to hide from the conflict. The most notable military battle in Texas during the war occurred on September 8, 1863. At the Battle of Sabine Pass, a small garrison of 46 Confederates from the mostly-Irish Davis Guards under Lt. Richard W. Dowling, 1st Texas Heavy Artillery, defeated a much larger Union force from New Orleans under Gen. William B. Franklin. Skilled gunnery by Dowling's troops disabled the lead ships in Franklin's flotilla, prompting the remainder—4,000 men on 27 ships—to retreat back to New Orleans. This victory against such overwhelming odds resulted in the Confederate Congress passing a special resolution of recognition and President Jefferson Davis stating: "Sabine Pass will stand, perhaps for all time, as the greatest military victory in the history of the world." In 1864, many Texas forces, including a division under French Prince Camille de Polignac, moved into Northwestern Louisiana to stall Union Maj. Gen. Nathaniel Banks' Red River Campaign, which was intended to advance into Texas from its eastern border. Confederate forces halted the expedition at the Battle of Mansfield, just east of the Texas border. The last engagement of the Civil War, the Battle of Palmito Ranch, was fought in Texas on May 12, 1865, and over one month after Robert E. Lee's surrender on April 9, at Appomattox Court House, Virginia. In the spring of 1865, Texas contained over 60,000 soldiers of the Army of the Trans-Mississippi under Gen. Edmund Kirby Smith. As garrison troops far removed from the main theaters of the war, morale had deteriorated to the point of frequent desertion and thievery. News of the surrender of Lee and other Confederate generals east of the Mississippi finally reached Texas around April 20. Local Confederate authorities had mixed opinions on their future course of action. Most senior military leaders vowed to press on with the war, including commanding general Kirby Smith. Many soldiers, however, greeted frequent speeches whose theme was "fight on, boys" with derision, or simply failed to attend them. The month of May brought increasing rates of desertion. News of Joseph E. Johnston's and Richard Taylor's surrenders confirmed that Texas, Louisiana, and Arkansas were now essentially alone to continue the Confederate cause. On May 14, troops in Galveston briefly mutinied, but were persuaded to remain under arms. However, morale continued to sink. Generals John B. Magruder and Kirby Smith (who had already corresponded with Union Maj. Gen. John Pope regarding surrender terms on May 9) no longer sought to rally their demoralized troops, but rather began discussing the distribution of Confederate government property. Magruder pled that the rapid disbanding of the army would prevent depredations by disgruntled soldiers against the civilian population. The haste to disband the army, combined with the pressing need to protect Confederate property from Union confiscation, created general mayhem. Soldiers began openly pillaging the Galveston quartermasters’ stores on May 21. Over the next few days, a mob demanded that a government warehouse be opened to them, and soldiers detained and plundered a train. Several hundred civilians sacked the blockade runner Lark when it docked on May 24, and troops sent to pacify the crowd soon joined in the plunder. On May 23, residents in Houston sacked the ordnance building and the clothing bureau. Riots continued in the city until May 26. Both government and private stores were raided extensively in Tyler, Marshall, Huntsville, Gonzales, Hempstead, La Grange, and Brownsville. In Navasota, a powder explosion claimed eight lives and destroyed twenty buildings. In Austin, the state treasury was raided and $17,000 in gold was stolen. By May 27, half of the original Confederate forces in Texas had deserted or been disbanded, and formal order had disappeared into lawlessness in many areas of Texas. The formal remnants of Kirby Smith's army had finally disintegrated by the end of May. Upon his arrival in Houston from Shreveport, the general called a court of inquiry to investigate the "causes and manner of the disbandment of the troops in the District of Texas, New Mexico and Arizona." The May 30 findings laid the blame primarily on the civilian population. Kirby Smith addressed his few remaining soldiers and condemned those that had fled for not struggling to the last and leaving him "a commander without an army– a General without troops." On June 2, he formally surrendered what was left of the Army of the Trans-Mississippi. Camp Ford, aka Camp Ford Prison, was a Confederate prisoner of war camp near Tyler, Texas, during the American Civil War. It was the largest Confederate prison west of the Mississippi River. Established in the spring of 1862 as a training camp for new Confederate recruits, the camp was named in honor of Col. John Salmon Ford, a Texas Ranger and the Superintendent of Conscripts for the State of Texas. The first Union prisoners to arrive at Camp Ford in August 1863 included officers captured in Brashear City (present-day Morgan City), Louisiana. The captives were initially held in the open, but a panic ensued in November 1863 when 800 new prisoners threatened a mass breakout. A military stockade enclosing 4 acres was soon erected. With more than 2,000 new prisoners arriving from Louisiana on April 8 and 9, 1864, as a result from the battles of Mansfield, and Pleasant Hill, the stockade quadrupled in size. With additional prisoners captured in Arkansas, the prison's population peaked at nearly 5,000 in July 1864. The population was reduced by prisoner exchanges in July and October 1864, and again in February 1865. The last 1,761 prisoners were exchanged on May 22, 1865. Following the Civil War, Northern investors helped to develop a thriving cattle industry in Texas. Thousands of former slaves found work as cooks or cattle herders. President Andrew Johnson appointed Union General Andrew J. Hamilton, a prominent politician before the war, as the provisional governor on June 17. He granted amnesty to ex-Confederates if they promised to support the Union in the future, appointing some to office. Federal troops did not arrive in Texas to restore order until June 19, 1865, when Union Maj. Gen. Gordon Granger and 2,000 Union soldiers arrived on Galveston Island to take possession of the state and enforce the new freedoms of former slaves. The Texas holiday Juneteenth commemorates this date. The Stars and Stripes were not raised over Austin until June 25. In the summer of 1865, many questions remained unanswered. How should Southern states be readmitted to the Union? How were newly freed African Americans to be assimilated, especially in the South? Lincoln's successor, President Andrew Johnson, enacted a plan for the Reconstruction of the Union. It called for a convention process through which provisional governors would preside over individual states to repeal secession ordinances, frame a new constitution, and repudiate the war debt. Voters would then adopt the convention results and elect a governor and legislators who, in turn, would ratify the 13th Amendment to the U.S. Constitution. With no African American delegates and the will to meet only the minimum requirements for readmission to the Union, Texas's 1866 Constitutional Convention gave newly freed African American men the right to sue or be sued, to contract and be contracted with, to acquire and transmit property, to obtain equal criminal prosecution under the law, and to testify orally in any case involving another African American. Significantly, the 1866 constitution did not allow African Americans to hold public office or to vote. When the newly elected 11th Texas Legislature met in August 1866, the members refused to ratify either the 13th Amendment, which abolished slavery, or the 14th Amendment, which granted citizenship to African Americans. The legislature wanted to return Texas as much as possible to the way it was before the war and restrict the rights of African Americans. African Americans, especially former slaves, understood what freedom was supposed to mean and struggled mightily to obtain it. In many instances, the newly freed men were illiterate and lacked academic knowledge, but they immediately applied their innate intelligence upon liberation. An anti-Johnson U.S. Congress elected in late 1866 passed the First Reconstruction Act in March 1867. 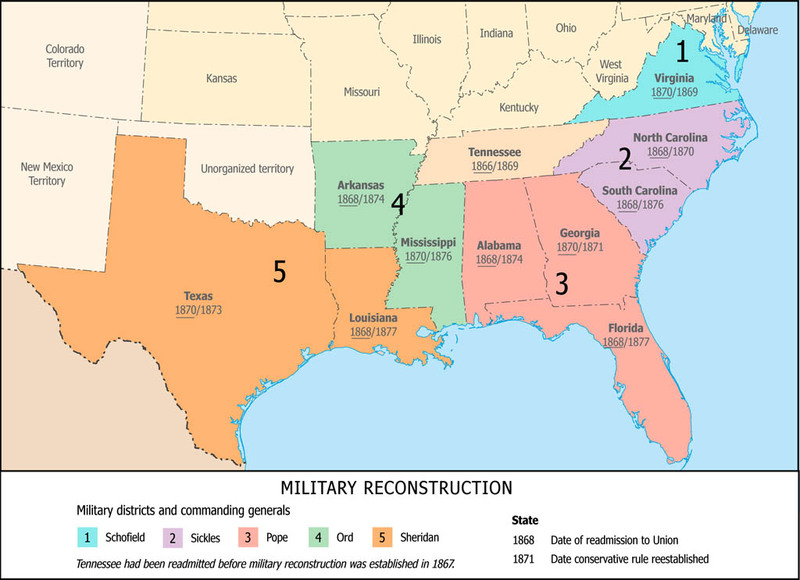 Ushering in the era of Congressional Reconstruction, the law wiped out the ten Southern state governments and grouped them into five military districts. Each district was to hold a convention to frame a new constitution that would give African American males the right to vote and would ratify the 14th Amendment. Only then could a state be readmitted to the Union. Texas's new constitution, ratified by voters in November 1869, gave support to public education and granted suffrage to adult male African Americans. Shortly thereafter, the 12th Texas Legislature (1870-71) approved the 14th and 15th Amendments to the U. S. Constitution. President Ulysses S. Grant proclaimed Reconstruction in Texas at an end on March 30, 1870. Riding the wave of federally supported reconstruction policies and led by the recently elected Republican Governor Edmund J. Davis, the predominantly Republican 12th Texas Legislature (1870-71), with 14 elected African Americans, focused its efforts on education, economic development, and immigration. The radical Davis, however, used the opportunity to increase his powers as governor and strengthen the Republican party. His efforts included postponing regular elections to extend the terms of the radicals and the appointment of a number of state and local officials. The legislature also encouraged economic development through railroad expansion and immigration through grants or sales of public lands. Several of the 24 African American legislative members played an active role in the early 1870s. Representative Richard Williams introduced bills to establish a Normal School in Walker County and to incorporate the Texas Wells and Irrigation Company (the latter bill passed). Representative John Mitchell promoted education for African Americans. He also helped push a bill through the Education Committee that concerned the Gregory Institute, a grade school first established by the Freedmen's Bureau in 1866. The tide changed during the elections in late 1872. Angered by Governor Davis's creation of a state police force, tax increases, and a growing state debt, Texans elected a Democratic majority to the House of Representatives and a Democrat, Richard Coke, as governor. The new government abolished the state police force and localized the state school system. During this period, African American Representative Meshack Roberts worked to establish Wiley College, the first college-level school for African Americans west of the Mississippi. By the late 1870s, the Democrats had united with white supremacists to gain political control and force African Americans back into servitude. The Ku Klux Klan was on the rampage, not only against African Americans but also against their white sympathizers. There was so much violence against African Americans that many contemplated leaving Texas, and several did leave. Representative Richard Allen, who had been very active in the 12th and 13th Legislatures, estranged himself from most other African American politicians in 1879 and began urging African Americans to move to Kansas. This exodus to the sunflower state promised more educational and economic advantages to those African Americans willing to relocate. Texas, as part of the Wild West, also witnessed infamous outlaws as well as the railroads in the 1880s, thus ending the cattle drives but connecting Texas, by rail, with most of the nation. See also American Civil War Homepage and Texas History Homepage. How important was Texas during the Civil War? Did Texas have the right to secede? Should the State Capitol of Texas be allowed to fly the Confederate flag? Sources: National Park Service; Library of Congress; National Archives; US Census Bureau; Official Records of the Union and Confederate Armies; The Union Army; Texas State Library and Archives Commission; Baum, Dale. The Shattering of Texas Unionism: Politics in the Lone Star State during the Civil War Era Louisiana State University Press, 1998; Bell, Walter F. "Civil War Texas: A Review of the Historical Literature" Southwestern Historical Quarterly 2005 109(2): 204-232; Buenger, Walter L. Secession and the Union in Texas. University of Texas Press, 1984; Clampitt, Brad R. "The Breakup: the Collapse of the Confederate Trans-Mississippi Army in Texas, 1865" Southwestern Historical Quarterly 2005 108(4): 498-534; Elliott, Claude. "Union Sentiment in Texas 1861-1865" Southwestern Historical Quarterly 50:4 (April 1947); Evans, Clement A., Confederate Military History. Atlanta, Georgia: Confederate Publishing Company, 1899; Frazier, Donald S. Blood and Treasure: Confederate Empire in the Southwest (1995); Frazier, Donald S. Fire in the Cane Field: The Federal Invasion of Louisiana and Texas (2009); Grear, Charles. Why Texans Fought in the Civil War (2010); Jewett; Clayton E. Texas in the Confederacy: An Experiment in Nation Building (2002); Kerby, Robert L. Kirby Smith's Confederacy: The Trans-Mississippi South, 1863–1865 Columbia University Press, 1972; Lowe, Richard G., and Randolph B. Campbell. Planters and Plain Folk: Agriculture in Antebellum Texas Southern Methodist University Press, 1987; James Smallwood, "Disaffection in Confederate Texas: The Great Hanging at Gainesville," Civil War History 22 (December 1976); Wooster, Ralph A. Civil War Texas: A History and a Guide. Texas State Historical Association, 1999. ISBN 0-87611-171-1; Wooster, Ralph A. Lone Star Blue and Gray: Essays on Texas in the Civil War (1996); Wooster, Ralph A. Texas and Texans in the Civil War (1996); Almaráz, Félix D., Jr. (1971), Tragic Cavalier: Governor Manuel Salcedo of Texas, 1808–1813 (2nd ed. ), College Station, TX: Texas A&M University Press, ISBN 0-89096-503-X; Barr, Alwyn (1996), Black Texans: A history of African Americans in Texas, 1528–1995 (2nd ed. ), Norman, OK: University of Oklahoma Press, ISBN 0-8061-2878-X; Campbell, Randolph B., An Empire for Slavery: The Peculiar Institution in Texas, 1821-1865, Baton Rouge: Louisiana State University Press, 1989; Chipman, Donald E. (1992), Spanish Texas, 1519-1821, Austin, TX: University of Texas Press, ISBN 0-292-77659-4; Edmondson, J.R. (2000), The Alamo Story-From History to Current Conflicts, Plano, TX: Republic of Texas Press, ISBN 1-55622-678-0; Hopewell, Clifford (1994), James Bowie Texas Fighting Man: A Biography, Austin, TX: Eakin Press, ISBN 0-89015-881-9; Vazquez, Josefina Zoraida (1997), "The Colonization and Loss of Texas: A Mexican Perspective", in Rodriguez O., Jaime E.; Vincent, Kathryn, Myths, Misdeeds, and Misunderstandings: The Roots of Conflict in U.S.–Mexican Relations, Wilmington, DE: Scholarly Resources Inc., ISBN 0-8420-2662-2; Williams, David A. (1997), Bricks Without Straw: A Comprehensive History of African Americans in Texas, Austin, TX: Eakin Press, ISBN 1-57168-041-1.